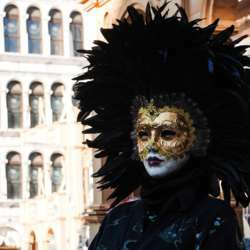 The Mask carnival became a public festivity nearly a thousand years. Venecians have fun in the whole city, during which people could indulge in music, dances and parties, barely working. Wearing masks and costumes made it possible for people to hide any differences of class or status, and it was even allowed to make fun of the aristocracy. This time of regulated social outburst was a way for the Most Serene Republic of Venice to maintain order and power throughout the rest of the year.